Rock Climbing is the fastest growing outdoor sport in the world and this one-day Introductory Adventure will show you why. Learn with some of Australia's most experienced instructors on the best introductory climbs in the Blue Mountains! Rock Climbing is the fastest growing outdoor sport in the world and this two day Introductory Adventure will show you why. Learn with some of Australia's most experienced instructors on the best introductory climbs in the Blue Mountains! 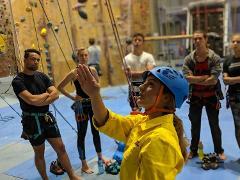 Once you've mastered the basics of Rock Climbing, this course will take you one step higher! This comprehensive four day course is a combination of our Rock 1 & 2 Courses. 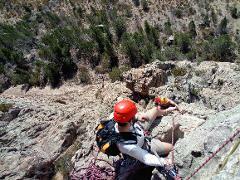 You will start with the basics and finish this course able to rig your own climbing ropes! 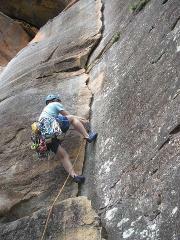 All in the world-famous Blue Mountains at spectacular climbing crags! If you've had some experience seconding or top-rope climbing outdoors and would like to take the next step, our 2-day sport climbing course will introduce you to leading bolted sport routes. This three-day Blue Mountain Trad-climbing course will teach the aspiring lead climber the skills required for safe, efficient lead climbing on traditional climbing gear. This course will provide you with the skills required to initiate a Self Rescue in virtually any rock climbing related scenario. 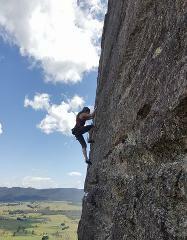 All inclusive climbing trip to Australia's premier climbing destination, Mt Arapiles in Victoria.